The perfect addition to the new flawless by Sonya™Cosmetic collection. 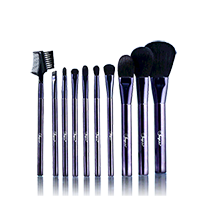 This deluxe set of beautifully created brushes has super soft synthetic bristles for the ultimate flawless look, and comes complete with a satin-lined brush pouch. While applying your makeup and using your brushes, simply stand the pouch up and fold down the top for easy access. Embrace your artistic inspirations with this versatile 10-piece Brush Collection that easily creates flawless looks from start to finish. The chic pouch doubles as a standing easel for easy access during application.